In anything except for relationships, it is always grand to return to your first love. As a young and nubile prince of reviewers, I first began to review for Tyndale with their ]] series and then, the ]]. Even though the time for reviews had long since passed and I had been turned down once; yet the kind folks, sensing the my need for the NLT relented and sent me my first one… the one that changed devotional reading. This edition of the New Living Translation promises to drive reading in much the same way a new translation does — by mixing it up. 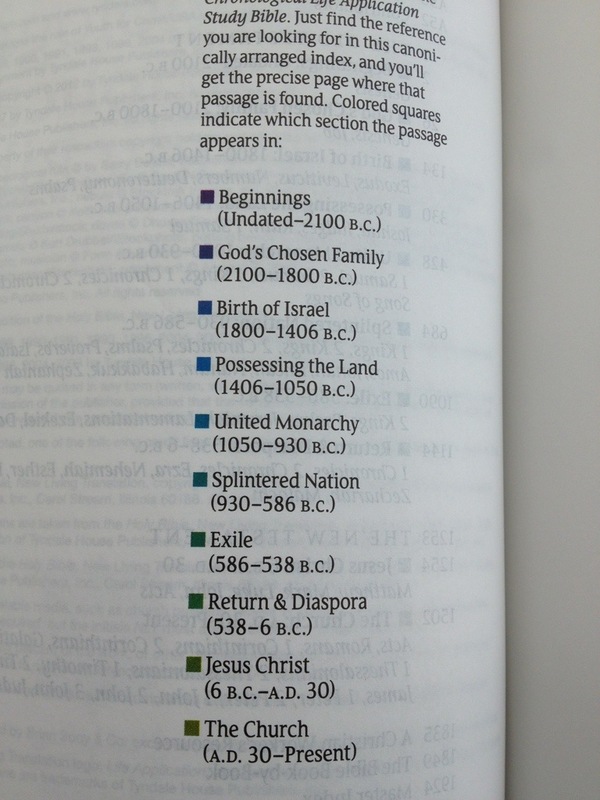 First, let us discuss the question that is pressing: Why do we need a bible set in a chronological line? Canonical theists may argue for a reading as it is set in canon. I would prefer a reading of the time of composition. The Chronological method straddles the fence between both of these in a good way. It sees Scripture as a grand narrative not of a set of authors and audience, but one of Author and one audience. Is this new? Maybe, or maybe it is presented with a foot in the past and a hand on the door of the future. Why then do we need to have such an edition? Are we not destroying sacred canon? No. After all, the canon is only recently settled, with different orders appearing in the Reformation. Reading the bible in such a way is beneficial because it helps those who struggle with viewing Scripture as a great whole (even the noted the literary theorist, Northrop Frye who struggled with religion and Christianity could see the completeness of Scripture) while maintaining their place in the grander narrative. Further, on a slightly different level, reading the bible with its self-proclaimed chronology helps to examine how different authors write of different events — thus it becomes both a scholarly and a theologically method. The method here is to take the books along the calendar which they portend to, or tradition tells us, they follow. Therefore, you begin with Genesis even though scholars may argue it comes after other books if we were to date it by composition event because it begins the story. Added to this concept is the infusion of different parts of the story. For instance, Kings and Chronicles are placed inside one another so that a history is given that does not bare the marks of ideological driven drivel discovered if we were to separate them out. Paul’s letters are interspersed among Acts to provide a certain amount of theological detail to Acts and historical detail to the Pauline corpus. Likewise, there is here no synoptic problem. The Editors would make Tatian proud as they have made a modern day Diatessaron allowing the reader to read the story of Jesus from four angles, at once. Coupled with this method of reading are the notes from the Life Application Study Bible acting to give the bible an applicable feel to the believer. 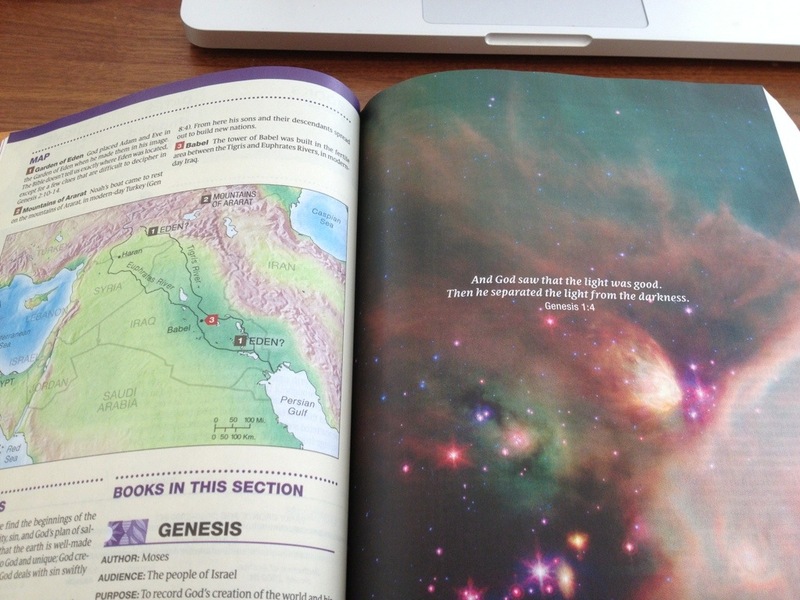 This bible is also filled with lots of color — timelines, charts, and pictures that help to amplify the passages and even books (a personal favorite is the picture of the act of Creation at the beginning of Genesis 1). 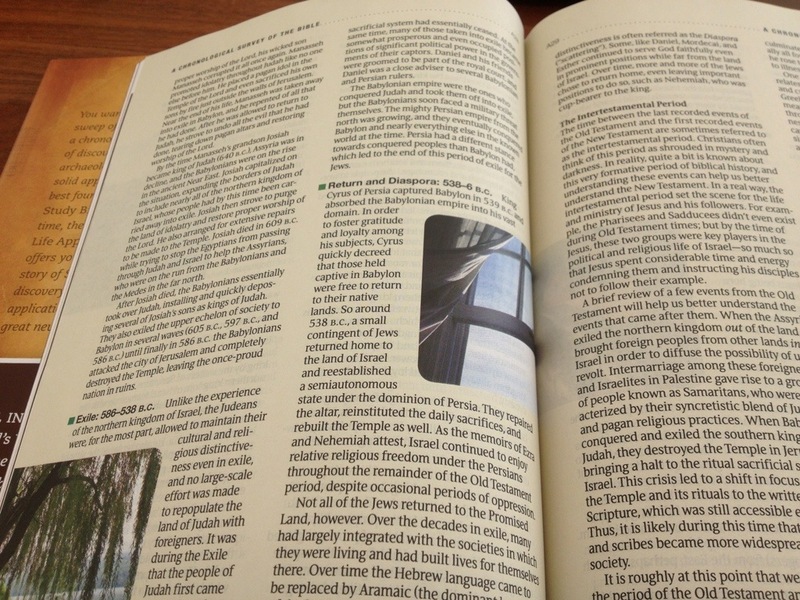 Various articles, such as “A Chronological Survey of the Bible” supplement the Life Application Study Bible notes, to allow for a deeper, investigative, study of the schema of the volume. On the top of each page is a progressing timeline so that the reader can know where she is at while reading that page. Of a particular note are the colors in Psalms. The title, theme, and author are noted in a shade of blue-green, like the eyes of the ocean. This, in my opinion, helps to separate what we have done from what the Psalmist has written. Of course the color of these headings and the headings for the rest of the volume match the color on the progressing time line. And, thank God, with all of this color, the editors have refused to use red for the words of Jesus. 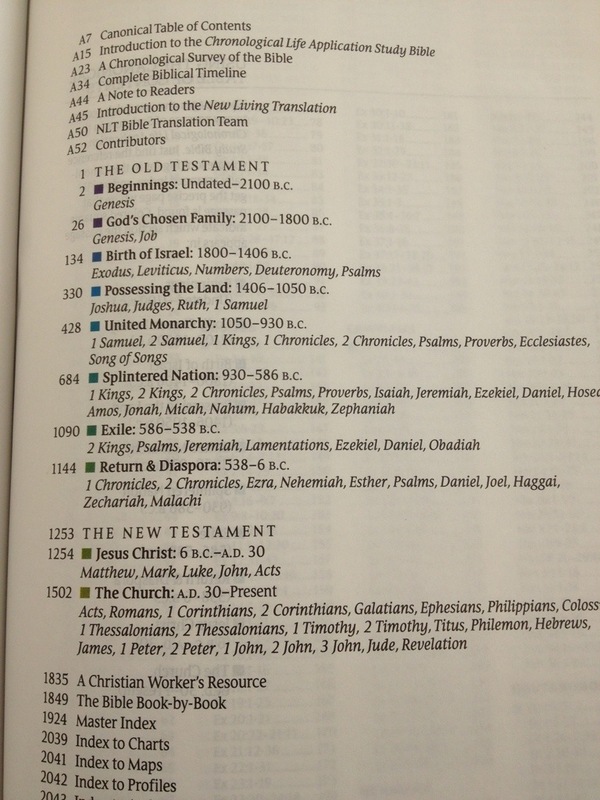 This, my friends, is a rather important point for me when selecting a bible. 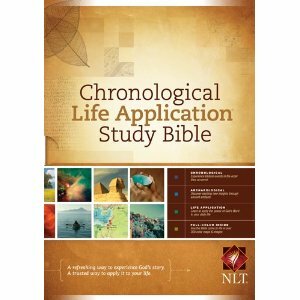 So, now comes the inevitable question: Would I recommend the NLT Chronological Life Application Study Bible? I would, but not because of some forlorn loyalty to the translation who kept me reading Scripture. Nor would I because I was provided this as a review copy. There is nothing to actually make me recommended a bible except for the fact that it is a good one. Yes, it is geared to more conservative Christians, including a Christian Worker’s Resource Guide that is, in fact, not about labor unions. Yes, it is deeply evangelical. But it is a solid translation for reading. The Life Application Study Bible notes are found in many churches across the denominational spectrum. Here, these notes that have served for years to guide believers into applying biblical precepts are coupled with an artistic take on telling the bible story as if it is a grand story of many interconnected parts, rather than a library sixty-six books. This is a great resource for renewing one’s appreciation of our place in the story of God. So yes, I would recommend it. I saw the subject of your post a while back and decided it was a combination of things: chronological Bible (which I didn’t own) and Life App. Study Bible (again, I didn’t have one) and a non-app/Logos/web-based version of the NLT (you guessed it…didn’t own one!). It has not disappointed me, although it has shown me how beholden I am to the canonical Bible…I have to flip incessantly sometimes and then resort to the canonical table of contents! I am becoming a fan of the NLT over the other translations. The Life Application notes have helped in some sermon/lesson prep as well.